The age they are turning is how much our special Birthday Treat Bear costs during their birthday month! Bring the birthday boy or girl in to count their candles any day during their birthday month, and the age they are turning is how much it costs to make their own Birthday Treat Bear! Regularly $14, Count Your Candles, pay your age – our birthday treat to you! Our Count Your Candles offer is available in stores only to Build-A-Bear Bonus Club members. If you’re not a Bonus Club member, it’s FREE and EASY to join – and you can also earn points toward valuable rewards! When your child celebrates their birthday at Build-A-Bear Workshop, they get the full Build-A-Bear experience! In addition to our Count Your Candles offer, every birthday celeBEARation includes the following – at no additional charge! Is it only on their birthday? When can we participate? This offer is available any time in the month of their birthday. Do I need proof of age? When the birthday child comes into the Workshop, just let us know you’re celebrating a birthday and together we will “count their candles” to let us know how old they are turning. No need to bring in any proof of age or identification. Do I need to add my child’s birthday into my Build-A-Bear Bonus Club account to participate in Count Your Candles? At this time, you do not need to indicate your child’s birthday in your Bonus Club account. Just visit the Workshop during your child’s birthday month, and we’ll take it from there! Do I need to sign up my child for the Build-A-Bear Bonus Club to pay their age for the Birthday Treat Bear? Guests must be 18 years old or older to sign up for Build-A-Bear Bonus Club; therefore, children under 18 are not required to sign up for Bonus Club. They need only accompany a Bonus Club member, or an adult over the age of 18 who signs up to become a Bonus Club member, during the month of their birthday to pay their age for the Birthday Treat Bear. Is Count Your Candles for any furry friend? The Count Your Candles offer is only available on the new Birthday Treat Bear to mark the special occasion. The Count Your Candles offer is a special experience delivered exclusively at Build-A-Bear Workshop stores. How old do you have to be? Is there a minimum? The Count Your Candles offer is for children under 14. 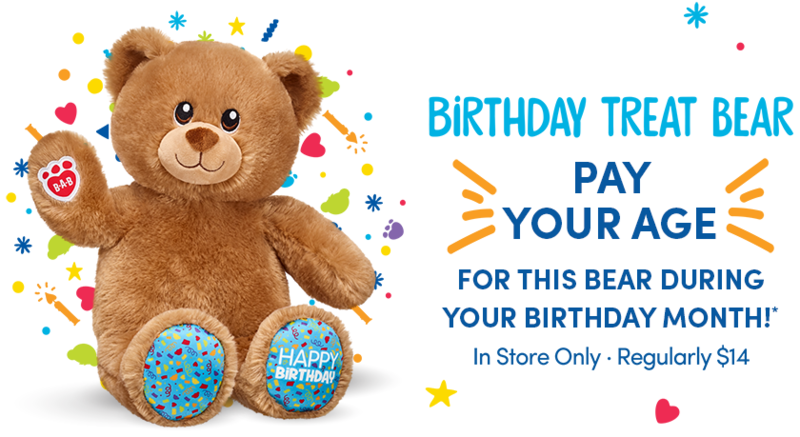 There is no minimum, you can be turning 1 and pay only $1 for the Birthday Treat Bear! What do I need to do to get this offer? The Count Your Candles offer is available to our Bonus Club members! Just sign up online, it’s free and easy! Then you’ll be asked to confirm account details (email address or account number) at check out! Check your local Workshop for availability? This offer is available in all U.S., Canada and U.K. Build-A-Bear Workshop stores and outlets. Offer not valid at Build-A-Bear Workshop® within other retail stores or restaurants, including but not limited to, Rainforest Café® or in Build-A-Dino® Experience within T-REX Café™. *Offer valid for Bonus Club members. Offer valid in stores only. Offer valid on Birthday Treat Bear only. Limit one per guest, must be present for offer. Cannot be combined with any other offer. While supplies last. Outfits and accessories sold separately. Minimum price $1. See an associate for details.